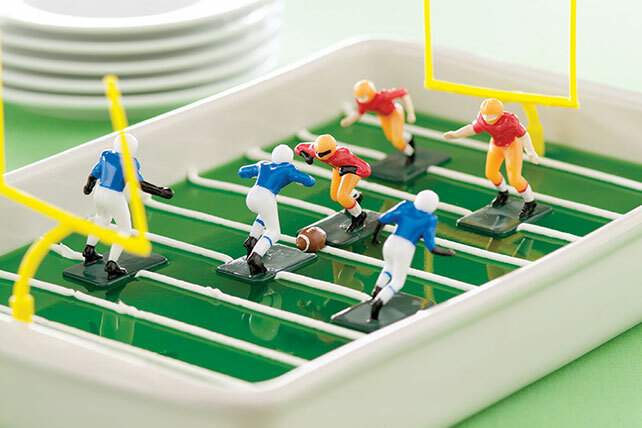 Lime gelatin is chilled in a 13x9-inch pan and decorated with whipped topping to resemble a football field. It's the perfect dessert for sports lovers! Add boiling water to gelatin mixes in large bowl; stir 2 min. until completely dissolved. Stir in cold water. Pour into 13x9-inch pan. Use COOL WHIP to draw "yard lines" on gelatin. Arrange toy football figures and decorations on gelatin. Place pan in refrigerator before pouring in gelatin to prevent spilling.